Yesterday I picked up a copy of the Record Collector magazine at the train station in Stockholm. 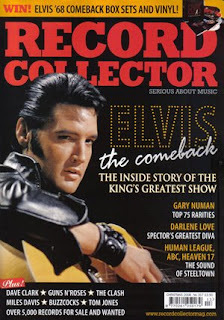 The reason for this was that it featured Elvis on the cover and "the inside story of the King's greatest show," the '68 Comeback Special. Turned out this was a good day to buy the magazine, as it was exactly 40 years since the show aired. So I felt it a fitting tribute, sitting on the train bound for home, reading the article and listening to Burbank 68 and Let Yourself Go! on my faithful Ipod. The article was based mainly on an interview with director Steve Binder. In all fairness, there wasn't much in it that I hadn't heard before. More interesting (at least to me) were some short interviews made with people connected with the show, such as guitarist Mike Deasy and Elvis fan Maria Columbus, who was lucky enough too attend both sit down shows. Reading Steve Binder's words made me think of an article I mentioned briefly in one of my earliest postings, from August last year. The article was published in the April/May issue of the Official Elvis Presley Fan Club magazine and titled "The Other Side of the Story." In it, Alfred di Scipio, the Singer Sewing Executive for the TV-special, was interviewed by Bill Bram (author of Elvis: Frame by Frame). What's so interesting with the article, is that di Scipio offers a different look at the making of the TV-special than the one Steve Binder does. For example, he says that it was he, and not Binder, that convinced the Colonel that the special should not be a Christmas special. What makes this believable is the reproduction of a memo dated May 16th, 1868 (prior to Binder's involvement) that summarize a meeting between NBC, Singer and the Colonel. The memo states that "di Scipio was able to convince Parker that the program ought not to be a purely Christmas oriented show but rather a program which would give audiences an opportunity to hear most of Presley's major hits..."
"Steve Binder, for some reason, each year, has increasingly less memory of the truth... He said he talked Colonel Parker out of doing a Christmas show. Now it was two months after I had gone to see the Colonel before Steve was hired to direct the show. He had nothing to do with that and I have trouble understanding how a very talented person can do that. You know they say if you tell a story and you tell it often enough, it becomes the truth..."